It's difficult to follow up such a gracious introduction from Anna, but I thought I'd introduce myself a bit more and share some of the exciting ideas I have for the future of the blog! 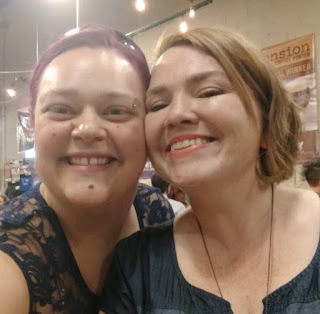 First about me: I am from the Greater Chicagoland Area (which Anna kindly hasn't held against me) and I've been working around town since I graduated from San Francisco State in '08. I worked at Steppenwolf on and off for over 10 years, starting as an intern, then apprentice, overhire and staff; it was my artistic home during the 'winter' season. For my summers I've done 9 seasons at The Santa Fe Opera, where I've met some of the most amazing, talented, and wonderful people and get to work on grand, obnoxious, and fantastic things. I've been a freelance Prop Master/ 'designer'/ crafter at a smattering of theatres in town and have recently been working at the Paramount Theatre in Aurora, IL. In my spare time I run a (tiny) greeting card business, embroider, marathon tv shows, try to keep up with my reading goal and drive long distances for fun, friends and food. Returning folx will notice that we have a new theme and our own domain! The theme is a work in progress, but I hope you all find it easy to navigate. To new readers, welcome! -I plan on adding a menu bar for easy access to post categories. So far I'm thinking sections like: Desserts, Drinks, Meats, Casting/Molding, Packaging, and Resources. This is definitely still a work in progress, and will evolve as we add more posts. -Post types. This will definitely still be a fake food blog, but sometimes there's just a good trick or funny prop that is just too good not to share. I like to think of these as bonus posts, like when you get a completely unexpected mint or piece of candy when you're at a restaurant. -Adding more supply, tool and technique posts. I've used FnB as a knowledge base as long as it's been up, and more knowledge the better! -Instagram! I've also started an insta to show off projects, tips, and of course, #fakefoodfriday posts to link back to the blog! I'm also thinking about a #WhatNotToDoWednesday, because mistakes happen. They happen so much. @fakenbakeblog, follow us! However you've stumbled upon us, I'm glad you've found the Fake 'N Bake Kitchen! And to Anna, thanks for passing the torch, still answering all of my random questions, and all of the puns. I LOVE THE PUNS. Hey, I know where this picture was taken! Ok, when my name doesn't come up I just sound like a stalker. So it's JT in case you didn't know. So now that I've made it weird I'm going to go. I'm glad you recognized it! It's only a little weird, it's okay.